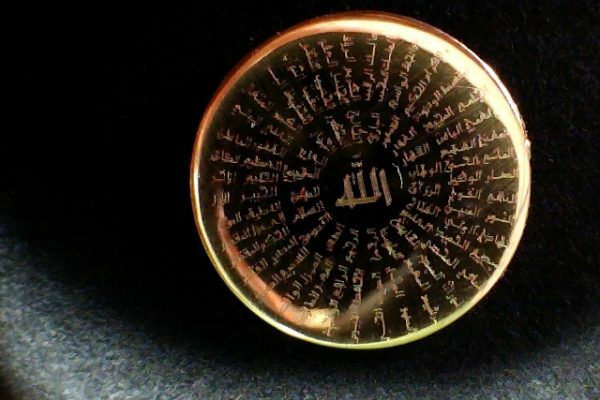 Nasima’s work exemplifies what modern Islamic Art is. It calls attention to significant issues within our society, all while incorporating relevant aspects of her Muslim and South-Asian identity. Throughout the course of its history, the Muslim community has been the source of some of the most beautiful, elaborate, and thought-provoking pieces of art. From complex geometric patterns to breathtaking works of calligraphy; the Muslim world has always had an affinity for incorporating visually striking elements in their everyday lives. We have come to a point in time where art is produced and marketed differently. The world of art is at our fingertips. The fact that we have the ability to create something and send it out to be viewed by the masses is a blessing; for both Muslim and Non-Muslim communities alike. In light of the age of social media; platforms like Instagram and Snapchat allow us to have unique interactions with artists. There is a place for everyone on social media to view content that appeals to their interests and personal identities. Nasima Ahmed, also known to her followers as ‘Moosleemargh, is a British-Bangladeshi creative. 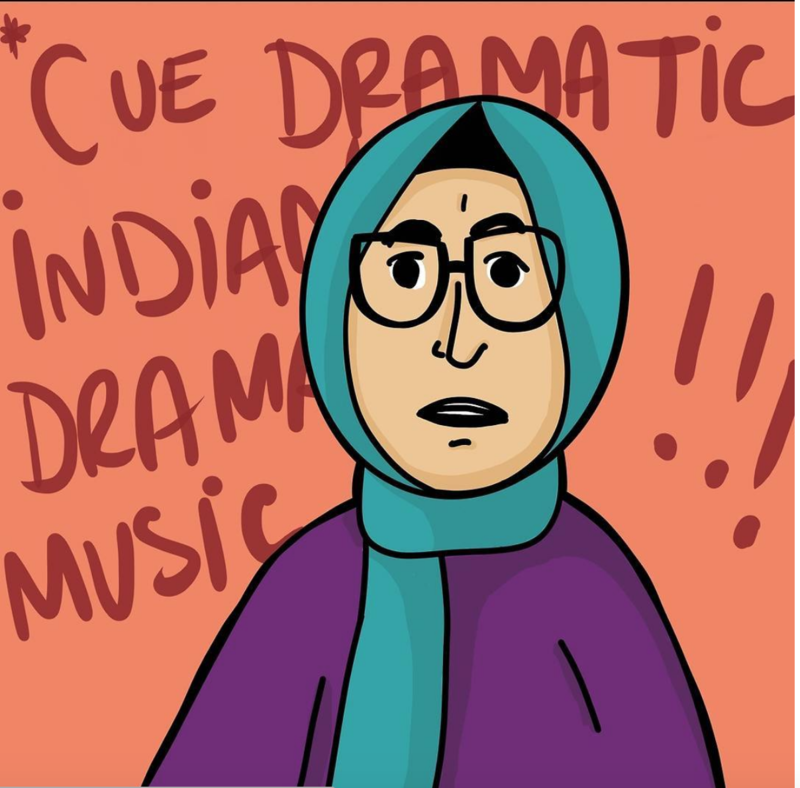 Her work touches on topics like the importance of representation, relatable interactions with Non-Muslims, and issues within the greater Muslim community through ornate (and often humorous) comic-like depictions. She has collaborated with well know Muslim organizations like Muslimgirl.com and Muzmatch. In addition to being a very talented artist, Nasima was kind enough to answer a few questions about her art, creative process, and the role her faith plays in her work. Q: When did you begin to take an interest in art? Nasima: Growing up, I was always interested in art and creating things. I have fond memories of my mother bringing home stacks of fax paper for me to draw on. I also used to make a lot of handmade cards for family and friends which my mother encouraged me to turn into a business but I didn’t have the courage to pursue. It’s really nice to be able to make a small career out of my art now. Nasima: Art is a creative outlet for me; I feel happy and at peace when I’m creating. Quite often, it’s not so much what the finished product looks like, but rather, it’s the process of sitting there and drawing or painting is what relaxes me. There were days when I would leave my assignments to just draw in order to de-stress. Art is also a fantastic way to convey certain ideas and spark conversations. Q: Tell me about what inspired you to create the Moosleemargh series? Nasima: I’ve always been conscious of representation — or should I say — the lack of it! I was following the artist ‘Hatecopy’ on Instagram and I loved the South Asian representation in her work. It inspired me to want to create something similar but for Muslim girls, especially those who wear hijab. It’s hard to feel normal when you don’t see anything that represents you in a normal way. Since starting, I received an unexpected amount of love from young Muslim girls who were so thankful for the representation and that is what drives me to continue creating art. Q: At what point did you decide to start sharing your work on social media? Nasima: Before Moosleemargh, I was already sharing bits of my work on my personal social media and other sites like DeviantArt. 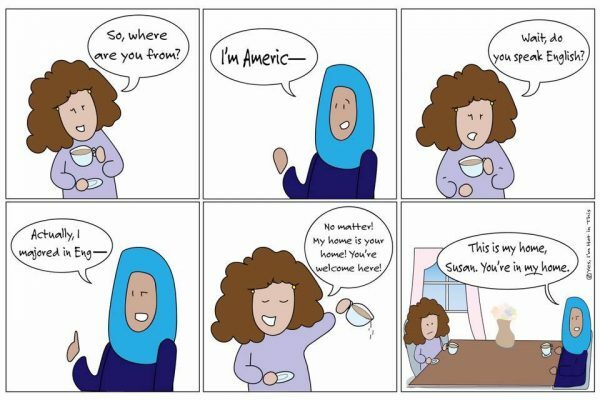 But none of my work was related to my Muslim identity; it was more fanart of TV shows and movies. It was only until the creation of Moosleemargh that I decided to fully invest in the sharing and promotion of my work. Q: How does your work represent your life/identity at a personal level? Nasima: My work is very personal to me and I often feel conscious when I post anything. Since a lot of my work is a product of my own thoughts, experiences, and humour it can make you feel vulnerable when you share it with such a large audience. I thought upon topics that I’ve gone through and it’s comforting to know that others can relate and from that, we build a sense of solidarity. Q: What is your creative process? How do you go about creating a new piece? Is it driven mostly by personal experiences? Nasima: A lot of my posts are derived from personal experiences or thoughts. I find that those make the best stories because it comes naturally. Oher times, I might work on a theme such as International Women’s Day. Q: What role does your faith play in the creation of your art? Nasima: I don’t force my faith into it, it falls naturally within my work just as it naturally falls into my life. The point of Moosleemargh is to make our faith and the practice of our faith, to come across as normal. Sometimes I do create specific works that focus on religion, such as the Ramadan series, commentary on the Niqab Ban and other hot news topics. But ultimately, my work isn’t about religion, it’s about ordinary people who happen to follow this religion in everyday life. I always say that my work is made for Muslim girls, first and foremost, but I do appreciate when non-Muslims are able to appreciate and learn from my work and gain an understanding of my religious values and experiences. Q: Thematically, ‘representation’ seems to play a big role in your work; how do you think art can help spread awareness regarding diversity? Nasima: I find that audiences respond effectively to visuals, whether it’s illustration, a video or a bold fashion statement. As art is interpreted differently it is open to endless debates, so it’s definitely an effective tool to communicate ideas and awareness. Along with social media, it’s even easier to share and consume art. Q: Who are some artists that have influenced your work? Nasima: Lichtenstein is a great inspiration. I first came across him during an art trip to the Tate Britain Gallery when I was 14. Amongst all the other classical art, he caught my eye due to the colorful and comical nature of his work. One of my beloved pieces titled ‘So Haraam!’ is a recreation of his work. I also grew up reading Jaqueline Wilson books which were illustrated by Nick Sharratt, I’ve been told that my style reflects his so I feel that I’ve been subconsciously inspired by him in my work! Q: Do you ever find yourself without inspiration? If so, what do you do to get your creative juices flowing again? Nasima: Definitely! There are days that I have no ideas or even lack motivation. I think the best thing to do is to not beat yourself up about it. I like to look at what my fellow artists are creating as I feel that surrounding yourself with creativity can help stimulate ideas. 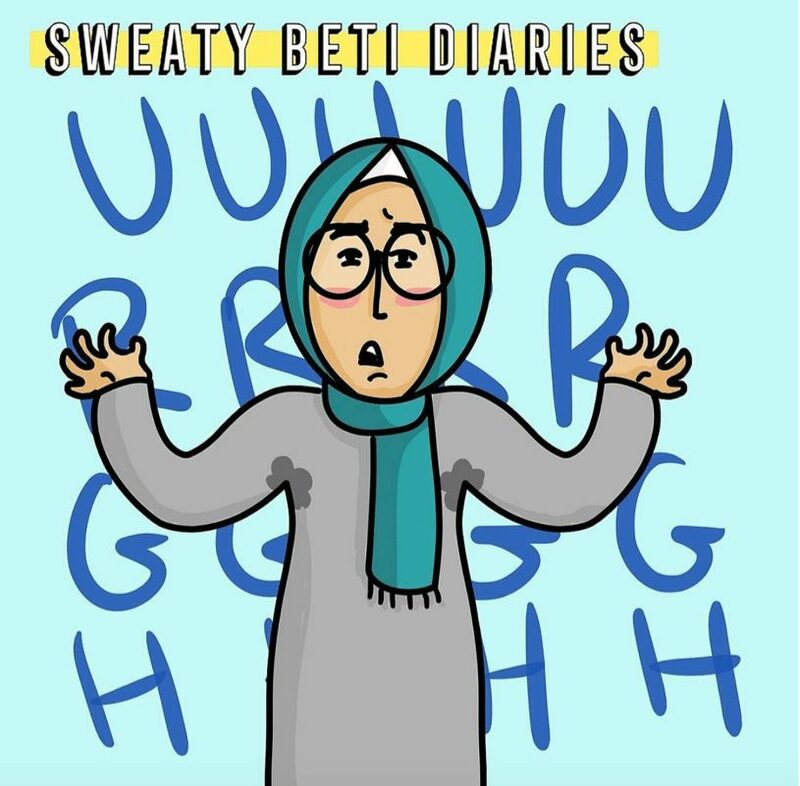 I also like to revisit old works to see if I can improve it or produce a new comic out of it, for example, my sweaty betti series. I like to switch it up; from digital art to painting, to classic pen and paper drawings. Nasima’s work exemplifies what modern Islamic Art is. It calls attention to significant issues within our society, all while incorporating relevant aspects of her Muslim and South-Asian identity. The Mooslemargh series, as well as many other culturally-oriented displays of art, are important to Diasporic communities living across the world. It helps us stay rooted in our traditions and we should honor those who are able to make these experiences possible. 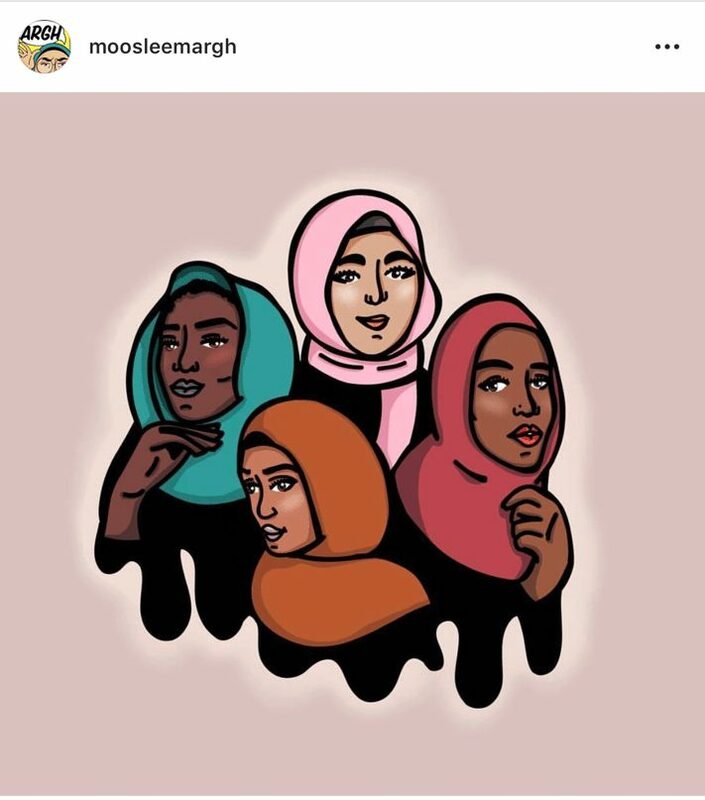 You can find more of Nasima’s work on Instagram @moosleemargh where she has also linked her etsy store that includes pins, prints, and other accessories. Shaiful is a student currently pursuing his bachelors in both History and Religious Studies. He enjoys drinking Chai, over-analyzing shows on Netflix and reading during his free time.